Christen & I, seventeen years ago, having just been pronounced married. Yes…we were just kids. 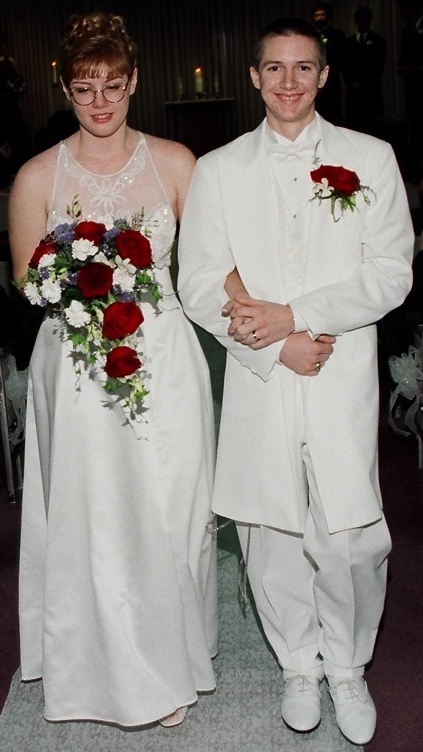 Seventeen years ago today, I married my amazing wife. Many don’t know, but when we married at only eighteen we had already been friends for roughly fifteen years. I don’t recall a time in my life when Christen wasn’t a part of it. Making it better. At thirty-five, having known someone for thirty-two years and lived with them for seventeen, it can be difficult to quantify just how much of an impact they’ve had on you. We’re inextricably linked. We’ve grown together for so long that it’s impossible to tell which parts of us were affected by the other. And I love that. We’ve had some rough times along the way. We nearly lost Christen to blood clots, we’ve had more medical issues and ER visits than any of us care to count, we’ve had lean times, had a kid, moved, changed jobs, and now have a teenager (what?!). But through it all we’ve also had each other. Even knowing all that, knowing every struggle we’ve faced in our 6,210 days of marriage, I’d marry her again in an instant. She’s the best thing that’s ever happened to me. Christen, you are an amazing and beautiful person. You make my life better and I am eternally grateful for it. I love you.